Offered at industry leading price, our range of Electrofusion Fittings ensures reliability, ease of Jointing and Long lasting Joint Life, These are in compliance with various industrial standards. Electrofusion Fittings is a method of joining MDPE, HDPE and other plastic pipes using special fittings that have built-in electric heating elements which are used to weld the joint together. The pipes to be joined are cleaned, inserted into the electrofusion fitting (with a temporary clamp if required) and a voltage (typically 40 V) is applied for a fixed time depending on the fitting in use. The built in heater coils then melt the inside of the fitting and the outside of the pipe wall, which weld together producing a very strong homogeneous joint. The assembly is then left to cool for a specified time. Pressure Rating: Upto 16 kg/ sq. Cm. We introduce ourselves as an eminent manufacturer, exporter, supplier, wholesaler & importer of Electrofusion Coupler. 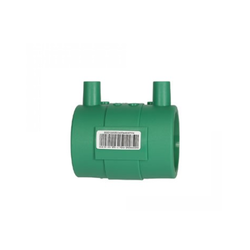 The offered electrofusion coupler is used for joining the HDPE and MDPE pipes in diverse industries like petrochemical, chemical and water treatment plant. This electrofusion coupler ensures reliability, ease of jointing and long lasting joint life. Offered product is meant to withhold higher pressure than other fittings can endure. 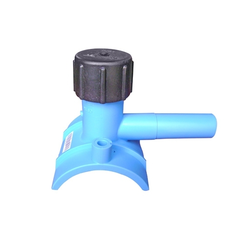 Offered at industry leading price, our range of electrofusion fittings includes Electrofusion Tapping Tee is customized as per the specifications of our clients. They are meant to with hold higher pressure than other fittings can endure. This product is made by using good quality material and latest machine technology under the supervision of the team of the professional. Electrofusion Tapping Tee is checked on various parameters to ensure zero defects.